On Saturday Chas had another brew day at his place. Was another good day with what should be a good beer. He’ll cover the details later. We did some tastings on the day. 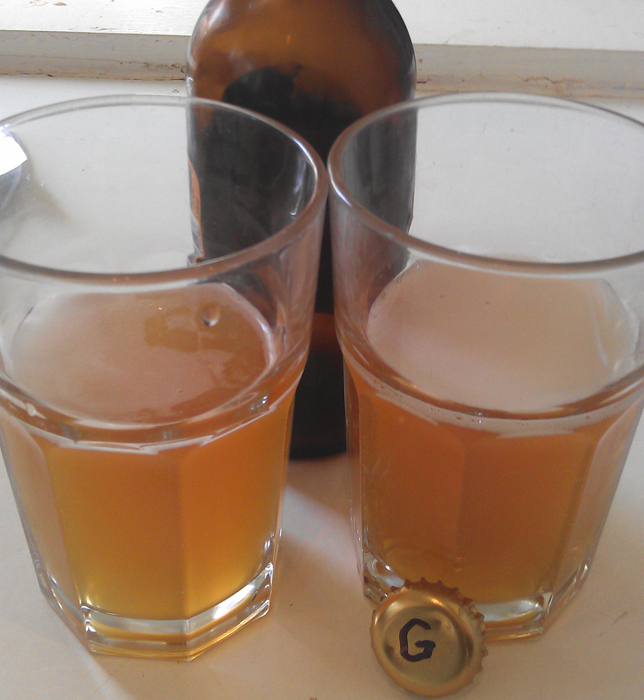 My Sneaky Cider and Chas’s Malted Cider 2. Two different takes on cider. The Malted Cider, a graft, was the second attempt by Chas. The first one was an okay drink. But each time I tried some it was eggy in aroma. Chas said that there was less egg smell in the other bottles. Anyway, onto the new version. And it had a slight eggy smell. Granted it was very slight, and Chas assures me that there isn’t any of that in other bottles. The main character for the aroma was the rich sweetness. Not a sickly sweetness like raw sugar, more like rich fruit. After the smell the first thing you notice is the feeling. It has a big creamy mouth feel. This fills out and gives the cider a lot of substance. I really like that a lot. The sweetness slowly builds. it doesn’t become too much, and that keeps this grounded. The malt helps with body and keeping the whole thing under control and smooth. There’s a nice apple flavour along the whole way. And that’s good, ‘cos a lot of apples went into this. This isn’t a drink I would choose for a session. More of something for an easy match with dinner after work, or before dinner. And this comes in at 6.4% alcohol. So another good reason not to knock back a few of these in a row. I’m really impressed with the substance of this cider. We talked about it on Saturday and agreed that there’s something missing. It’s like the cider is halfway between two points and doesn’t know where/what it wants to be. Maybe a different yeast and/or temperature might help. Or maybe just a different malt? I agree. This one’s too much one the fence. I’d like to push more malt flavours into this to really give it a direction. I haven’t tried another bottle yet, but that eggy smell needs to be sorted. Both recipes have used a wine yeast and I’m hoping this may be the culprit. Next time I think I’ll try an lager yeast – I’d like to keep the crispness, but give it some more beer-ness!